This series which dismantles the edifice of Gandhi’s Mahatmahood was necessitated by Prime Minister Narendra Modi’s unfortunate public exhortation to our armed forces fighting for their lives and the dignity of their uniforms to observe “restraint” in their operations in the Kashmir valley. Narendra Modi had just returned from his “pilgrimage” to South Africa and the atavistic connection between Kashmir and this Gandhi-bhakta was unmistakable considering Gandhi’s contempt for the army which too was detailed in Part 1. The secessionist fire raging in Kashmir today was lit in 1946 by Gandhi who instigated Nehru to interfere in the affairs of the Hindu kingdom as if the Hindu nation were Gandhi’s patrimony and the kingdom of Jammu, Kashmir, Ladakh and Tibet (Riyasat-e Jammu wa Kashmir wa Ladakh wa Tibet ha) were Nehru’s fiefdom. Gandhi also forced the Congress Working Committee to position itself against Maharaja Hari Singh while simultaneously legitimising the opportunist rise of jihadi Sheikh Abdullah in the kingdom’s polity during the turbulent period following the failure of the Cabinet Mission; the Cabinet Mission failed because after enthusiastically welcoming the proposals for transfer of power by the Cabinet Mission within three days of its arrival in Bharat, Gandhi proceeded to sabotage the Mission step by calibrated step. How Gandhi with the same cold calculating mind as Sheikh Abdullah sabotaged the Cabinet Mission is the theme of the next article in the series unravelling the Mahatma’s political game of dice as he gambled away the territory of the Hindu nation. From 1917, when Gandhi officially took charge of the party, the INC resembled the Kaurava Court as Patel, Rajendra Prasad, Nehru and JB Kripalani chose to look down and maintain silence while KM Munshi and Rajaji walked away from the court even as the freedom struggle culminated in Hindu genocide in 1946 quickly followed by vivisection of the Hindu nation in 1947. If Gandhi’s actions had consequences then the silence and inaction of Patel, Rajaji and Munshi had consequences too. When we deconstruct Gandhi’s so-called freedom struggle and examine the milestones which defined the struggle, we know that every political decision that Gandhi made on behalf of the Congress vis a vis the Muslim League and on behalf of all Hindus of the country vis a vis the Muslims, and every political action and agitation that he launched ostensibly against the British government and against Hindus who defied his passive resistance benefitted only and only the Muslims and Imperial London; Hindus got nothing. If anything, Hindus suffered irretrievable losses to their homes, homeland, life, property and their nation’s territory; in 1947, with India’s independence, Hindus lost political power too in Nehru’s Bharat. Imperial London watched Gandhi in South Africa very closely and manoeuvred Gandhi’s towering political ambitions precisely in the wanted direction and when the time was right, they pinned the halo of Mahatma around his head and sent him back to Bharat in July 1914. The timing of Gandhi’s return to Bharat from South Africa says it all. The British government’s farsighted move to paratroop Gandhi from South Africa to Bharat yielded spectacular results; the nation was vivisected and Mountbatten succeeded in leaving with Pakistan the critically vital territory of the kingdom’s northern areas which adjoined not only Afghanistan but also had a small but geopolitically important border with Central Asia. Mountbatten knew that Pakistan would automatically move into the western orbit for American and British aid in the economic and military spheres to keep abreast of Bharat’s abundant natural resources and proven native genius and that was the West’s leverage to control the territory overlooking China, Afghanistan and Central Asia. And what remained with Bharat of the kingdom of Jammu, Kashmir, Ladakh and Tibet, Mountbatten nudged Nehru to take it the United Nations. If Imperial London removed Tilak, Savarkar and Aurobindo to make way for Gandhi, Subhash Bose, KM Munshi and Rajaji, who unlike Patel were outspoken critics of Gandhi’s politics, were removed by Gandhi to make way for Nehru. Why did Gandhi leave South Africa in July 1914? Without going into details which are not germane to the theme of this article, suffice it to say that the South African government passed the Indian Relief Act on June 26, 1914 allegedly in response to Gandhi’s last and protracted passive resistance campaign which he launched in November 1913. As I have shown in my book Eclipse of the Hindu Nation, the Indian Relief Act gave very little to Bharatiyas but just enough to project Gandhi’s passive resistance as a very successful and “spiritual” weapon of engagement with colonial governments. Imperial London was well aware that Tilak was due to be released from Mandalay in June 1914 and there was every danger that the Indian National Congress, which was in a limbo after the British government removed Tilak and Aurobindo forcefully from the political arena in 1908-09 while simultaneously decimating the Nationalist faction of the INC which split in Surat in December 1907, would once again inevitably return to Tilak’s control. If Gandhi had to supplant Aurobindo and Tilak as leader of the INC with the same matchless moral authority and real power, then his stature would have to be muscularly and even artificially elevated to match the stature of Lokmanya Tilak. In January 1915 when Gandhi landed in Mumbai, his Mahatmahood rested only on the public announcement he made in March 1906 that he was giving up sexual relations with his wife, and the manipulated success of his last passive resistance campaign which was touted to have made the racist South African government responsive to a non-violent ‘coolie’. Just so would establishment historians in Bharat’s post-independence academe entrench the falsehood that the half-dhoti clad Mahatma brought the Empire down on its knees with his toothless smile and passive resistance. A clinical evaluation of Gandhi’s political activism in South Africa attests to clever manipulation of Gandhi’s ideas, actions and even the direction of Gandhi’s political activism by Imperial London (Lord Ampthill, William Wedderburn, Lord Hardinge and Lord Minto among others), sundry Christian missionaries and the INC’s Empire loyalists Gopalkrishna Gokhale, Surendranath Banerjee and Sir Mancherjee Bhownagree. Gandhi therefore had to be nudged to return to Bharat with a halo around his head and the South African government readily gave Gandhi a cause to launch his last “successful” passive resistance campaign. “Gandhi organized his satyagraha jointly against three laws: to protest the March 1913 ruling by Justice Searle in the Cape Supreme Court which de-recognized Hindu and Muslim marriages; the June 1913 Immigrants Regulation Amendment Act; and the notorious Three Pound Tax which came into effect in March 1911 and made it mandatory for every Bharatiya family who did not wish to continue their contracts as indentured labour and chose to stay on in South Africa as ‘free’ Bharatiyas, to pay a tax of three pounds per head to the South African state. In this way, an ex-indentured family paid as much as 15, 20 or even 25 pounds, depending on the size of the family. Children of ex-indentured Bharatiyas were not spared, and boys above 16 years and girls over 13 had to pay this crippling tax. Clearly the South African regime was determined to precipitate a crisis. We must revisit Gandhi in South Africa to know exactly what he fought for, what were his weapons or tools of engagement with the South African government and whether he succeeded because of his moral worth and efficacy of his tools or because the South African government gave him a little of what he wanted so that they could pin a halo around his head and push him out of South Africa and into Bharat where Imperial London had already planned a very large role for him in the INC to neutralise Lokmanya Tilak. This questioning must be done because the INC became a Kaurava Court only because even tall leaders of the Congress did not dare to publicly take down “Mahatma” Gandhi for fear of weakening the INC vis a vis a united, well-focused Muslim League. In November 1913, Lord Hardinge, the Viceroy of Bharat, in a speech in Madras expressed sympathy with the Bharatiya Passive Resistance struggle in South Africa, boosting Gandhi’s political and moral stature in Bharat, which had already been enhanced by Gokhale’s towering praise for him after Gokhale returned from South Africa: ‘Only those who have come into personal contact with Mr. Gandhi as he is now can realize the wonderful personality of the man. He is without doubt made of the stuff which heroes and martyrs are made; Nay, more. He has in him the marvelous spiritual power to turn ordinary men around him into heroes and martyrs’. Hardinge, let us recall, at exactly the same time that he was mouthing fulsome praise for Gandhji had just sentenced Savarkar to two sentences of ‘transportation for life’. Imperial London and Empire loyalists had already begun to prepare the ground for Gandhi’s triumphant return. The Indian Relief Act abolished the £3 poll tax, recognized marriages contracted in terms of traditional Bharatiya (Muslim or Hindu) rites, and facilitated the entry into the Union of the wives of Bharatiyas already domiciled locally. However, Bharatiyas remained disenfranchised and were still not allowed to own property in the two former Boer Republics (Transvaal, Orange Free State), or to live in the Orange Free State. Further, restrictions on Bharatiya trading remained in force. In short, the South African government did only the minimum necessary to boost Gandhi’s image as the non-violent deliverer of the Bharatiya people. As Smuts himself stated in the Senate on March 11, 1914, Gandhi was allowed to function in South Africa as he did ‘because he never advocated methods of violence to overthrow the government’. This would be Gandhi’s signature tune in Bharat when under his leadership the freedom struggle led by Tilak and Aurobindo would turn retrograde and would eventually culminate not in independence but in the vivisection of the Hindu nation. Gandhi would also feed the jihadi monster in the shape of Sheikh Abdullah and thus light the jihadi fire which continues to burn unabated till today. “We, the undersigned have, after mature deliberation, decided for the sake of the Motherland and the Empire to place our services unconditionally, during this crisis, at the disposal of the Authorities. We advisedly use the word ‘unconditionally’ as we believe that, at a moment like this, no service that can be assigned to us can be considered to be beneath our dignity or inconsistent with our self-respect”. This secretive pledge of loyalty and unconditional support to the Empire was signed by Gandhi, Kasturba and Sarojini Naidu and fifty other Bharatiyas. But significantly, Lajpat Rai, to his eternal credit, did not sign the loyalty and support pledge. Gandhi’s Mahatmahood in 1915 when he returned to Bharat, as shown, rested on weak foundations. Gandhi’s pledge of loyalty and support to the Empire must be understood in the light of the truth of Gandhi’s first major passive resistance movement in India after his return – in Champaran and Khera. To drive home the point to all Bharatiyas in general and to the INC in particular that passive resistance, humility and meekness alone were the only successful instruments of engagement with the colonial government, Gandhi and the British government in Bharat struck a back-room secret deal. The deal was – the British government would make Gandhi’s passive resistance campaign for the farmers of Champaran and Khera a significant “success” and Gandhi in turn would use the success to portray the British government as benevolent and generous and use the success to recruit ordinary gullible Bharatiyas enchanted with his Mahatmahood to fight for Britain in World War I – a war that had nothing to do with Bharat or Bharat’s Hindus. “I hope to translate the spoken word into action (reference to the secret pledge of loyalty and support for WWI signed in London by Gandhi) as early as the Government can see its way to accept my offer, which I am submitting simultaneously herewith in a separate letter. I recognize that, in the hour of its danger, we must give, as we have decided to give – ungrudging and unequivocal support to the Empire, of which we aspire, in the near future, to be partners in the same sense as the Dominions overseas. I would make India offer all her able-bodied sons as a sacrifice to the Empire at its critical moment. In Champaran, by resisting an age-long tyranny, I have shown the ultimate sovereignty of British justice. In Kaira, a population that was cursing the Government now feels that it, and not the Government, is the power when it is prepared to suffer for the truth it represents. It is, therefore, losing its bitterness and is saying to itself that the (British) Government must be a Government for the people, for it tolerates orderly and respectful disobedience where injustice is felt. Thus, Champaran and Kaira affairs are my direct, definite, and special contribution to the war. “Further I desire relief regarding the Kaira trouble. Relief will entirely disengage me from that preoccupation which I may not entirely set aside. It will also enable me to fall back for war purposes upon my co-workers in Kaira and it may enable me to get recruits from the district. The “common object” was to get Bharatiyas to fight and die for Britain in WWI. Thus the Mahatma’s halo which was newly pinned around his head in South Africa in 1914, with the manipulated success of his passive resistance campaign in Champaran and Khera by 1918, had become a permanent aura around his head. Gandhi had become invincible because the Mahatmahood bestowed upon him was a formidable shield. And it was this Mahatmahood which allowed him unchallenged and unquestioned authority to first de-Hinduise the Congress and transform it from a powerful political vehicle which the Congress had become under Tilak and Aurobindo’s leadership, to an impotent social reform organization which possessed neither the strength nor the sagacity to stop the Muslim League’s march towards creation of Pakistan. It was but a small step from de-Hinduised Congress to anti-Hindu Congress. It was also this Mahatmahood which enabled Gandhi to brew mischief, unrest and instability in several Hindu kingdoms in the name of civil liberties and temple entry at a time when he should have united all sections of Hindus to resist the Muslim League. Till the very end, it was Gandhi and Gandhi alone who drafted all resolutions of the CWC – the highest decision and policy-making body of the INC. It was Gandhi and Gandhi alone who made and executed all political decisions of the INC while the CWC was a mere puppet in the Mahatma’s hands. Not political freedom, not resisting impending vivisection but spinning wheel, khadi, cleaning latrines and temple entry was the Congress Creed. In the Congress Creed scheme of things, only Gandhi had the right to do politics; the tall leaders in the CWC played Bhishma, Drona and Kripacharya. In his Outside the Archives (pages 209-210, Sangam Books, 1984), YD Gundevia, Prime Minister Nehru’s last foreign secretary, recalls a Friday morning in December 1963, when Nehru held his customary free-for-all meeting with secretaries, joint secretaries, all deputy secretaries and some under secretaries. There being no specific agenda that particular day, Gundevia asked Nehru what would happen to the civil servant if, after being attuned only to Congress policies so long, the Communists were, tomorrow, elected to power in New Delhi. Nehru pondered long over the question and then said, “Why do you ever imagine the Communists will ever be voted into power at the Centre?” After a long pause, he said, spelling it out slowly and very deliberately, “The danger to India, mark you, is not Communism. It is Hindu right-wing communalism.” Towards the end of the meeting he repeated his thesis. The Muslims had Jinnah and the Muslim League; the Hindus had no one. First Gandhi, then Nehru and then Rahul Gandhi have spoken about Hindu political empowerment which they labelled ‘Hindu communalism’ as being worse than jihad. Modi and Amit Shah must know there can be no Congress-mukt Bharat without Gandhi-mukt Bharat. The kingdom of Jammu, Kashmir, Ladakh and Tibet was not a Muslim kingdom. The territories of the Hindus and the Buddhists in this kingdom dwarfed the Muslim population in the Kashmir valley. And yet, Gandhi and Nehru together encouraged the rise of Sheikh Abdullah in the Hindu kingdom. While the Muslim League towards the end of the 1930s decade had made it amply clear that their goal was Pakistan, Gandhi’s INC had lost sight of the political objective – political freedom from colonial rule and resisting the threatened vivisection of the nation. Gandhi had not only de-Hinduised the INC, he was explicitly anti-Hindu. Gandhi’s anti-Hindu prejudices extended to Hindu maharajas and kings and to Hindu scholars and sanyasis. Briefly, while the Muslim League absorbed into itself all Muslim formations and organizations and faithfully represented Muslim religious and political interests and objectives, while the Nizams and Nawabs with the Muslim League stood united in their common desire to return Muslim rule over Bharat after the British withdrew or at the very minimum create the Islamic State of Pakistan, Gandhi not only refused to address the genuine concerns of the Hindu princely states but went so far as to appoint Jawaharlal Nehru and the Nawab of Bhopal to oversee their affairs in the troubled times when the country was sitting on the tinderbox of imminent Muslim League violence. Gandhi’s intense but barely cloaked animosity for nationalists like KM Munshi and NB Khare and for Hindu Maharajas was his subjective preference and yet he imposed his personal opinions, which were in some part unjustified and which for the greater part bordered on the fetish, on the CWC and on the INC. This anti-monarchy fetish was certainly the product of Gandhi’s English ‘liberal’ education in London and the pervasive presence of foreigners in his life which influenced his attitude towards Hindu kings and rulers. Western liberal education of the nineteenth and twentieth century was greatly influenced by the political trends in republicanism, charter of rights and democracy and the concurrent waning power of European monarchies and the power of the Church. It was fashionable in those times in Europe to be anti-monarchy and anti-orthodoxy and Gandhi subscribed to the fashion. The INC, instigated by Gandhi, triggered unrest in 1938 in Mysore, Rajkot, Jaipur, Cochin and Travancore; there was unrest in Talcher and Dhenkanal too. In all these small kingdoms Gandhi precipitated a crisis either in the name of civil liberties or temple entry for harijans. Needless to say the Congress meddled only in those states ruled by Hindu princes and kings; they did not dare to take similar liberties with Nawabs and Nizams. The Congress passed the Haripura resolution in 1938 with the clause of self-imposed restriction on direct interference in the Indian States; much like Pakistan’s ‘moral support’ for jihadis in Jammu and Kashmir, the Congress limited itself to moral support for the people in Indian States aspiring for civil liberties. Just how accurate is the description of the CWC as resembling the Kaurava Court can be gauged from the by now familiar silence of Patel, Rajaji and Rajendra Prasad when Gandhi offered to hand over Hindu kingdoms to the Muslim League. Verily, the territory of the Hindu nation was Gandhi’s patrimony which is polite English for ‘baap-ka-maal’. During the extremely turbulent years of 1946-47 when everything was in a state of flux and no one could predict accurately how and when transfer of power would happen if indeed it would happen at all, several Hindu rulers and Maharajas met Gandhi to probe his mind about what would be the fate of their kingdoms and provinces in the new dispensation. Among those who met Gandhi were the Deccan Princes and the Maharaja of Kapurthala. To them, like to all other princes and kings who met him, Gandhi had only one thing to say – become servants of your people. Etymologically the word may derive from ‘serve’ but the noun had acquired pejorative connotations and Gandhi, just as he had advised Morarji Desai to use the military to do only sanitation work, was now exhorting Kings to become servants. This was the same Gandhi who took great exception to white people in South Africa referring to all Bharatiyas as “coolies”. Even in South Africa, Gandhi who was infuriated at being called “coolie” however referred to native Africans derogatorily as “kaffirs”. Because Gandhi was not born white and because he took great pride in being the son of the Dewan of Porbundar who also had a privileged English education in London, Gandhi aspired to be dark white in social esteem and political status within the British Empire. Readers are invited to pay attention to Gandhi’s insulting views on Bharatiya “aborigines”, the Santhals. If Gandhi’s towering arrogance looked at native Africans with contempt in 1896, the same towering arrogance diminished the status of Hindu kings whom he advised to become servants of their people. There is a vast difference between Gandhi posturing to the world and choosing to call himself a “bhangi” and Gandhi condescendingly imposing the name “harijan” on people belonging to the scheduled castes, asking the Bharatiya army to do sanitation work, advising soldiers of the INA who returned to Bharat after the death of Subhash Bose to do farming, and exhorting kings to become servants. Gandhi had no qualms about handing over Hindu kingdoms to the Muslim League and he had no qualms promoting Sheikh Abdullah against Maharaja Hari Singh. “Only a few years ago the Princes felt that they could not be safe except under the Paramountcy of the British Crown. It seemed to have dawned on most of them that that was not the correct attitude. This was but natural, for they were after all sons of the soil. He had said openly on another occasion that the people of the States were slaves of slaves which the Princes were. Gandhi insulted the leaders of the Hindu princely states and sent them away dejected and uncertain about their fate. To add more insult to their already injured self-esteem and high status, Gandhi told them that unless they heeded Gandhi’s advice, their fate may well become worse in Nehru’s Bharat. There was no longer even a polite pretence that the Congress was a democratic organization. It was either Gandhi or Nehru who unilaterally decided all policies. Gandhi may have used the phrases “While I am still alive”, “In Jawaharlal’s scheme of free India”, “Jawaharlal considers” very naturally but it was an ominous portent of more dangerous things to come. During his negotiations with the Cabinet Mission, Gandhi stipulated that election of the 93 delegates from among Bharatiya rulers of the princely states to the Constituent Assembly will be determined by the Nawab of Bhopal and Nehru. If the princely states, a majority of whom were Hindus, failed to come to an agreeable solution there will be no delegates to represent them and their issue must be transferred to the Advisory Committee referred to in Clause 20 of the State Paper. Gandhi usurped to himself the right to decide not only who would be the delegates to the Constituent Assembly on behalf of the princely states but also arrogated to himself the right to deny them agency to decide their future. Even in that moment of acute anxiety for Hindu princely states, Gandhi did not have the vision to see an opportunity to reach out to them in solidarity and support; he saw in the meeting only a great opportunity to deliver what he considered was a well-deserved homily. It is striking that while he referred them to Nehru, he did not think he had to consult Rajaji or Patel who were more qualified intellectually to deal with this extremely complex and sensitive issue, or that instead of the Muslim Nawab of Bhopal he could have requested a Hindu ruler to undertake the task. It must mean something that Gandhi had to be assassinated to give Patel the freedom and the space to integrate all princely states into the Union of Bharat; with the exception of Jammu and Kashmir which Gandhi handed over to Nehru as reward for filial obedience. Gandhi’s penchant for entrusting Nehru with all major political responsibilities had less to do with Nehru’s political ability and more to do with Nehru’s sagacity in staying on the right side of Gandhi. It was Gandhi’s ‘moha’ for Nehru which drove a stake into the heart of the Hindu nation in 1946, when Gandhi subordinated the nation’s interest to Nehru’s personal whim in Jammu and Kashmir. Even as the INC was in the midst of the make or break negotiations with the Cabinet Delegation, trouble erupted in Jammu and Kashmir. Sheikh Abdullah, a commoner from the Valley saw a great opportunity in the generally troubled times, to realize his own towering Muslim ambitions in the turbulent years preceding 1947. Playing out the drama for civil liberties and ‘freedom’ that the INC had staged in Rajkot, Jaipur and other Hindu kingdoms, Sheikh Abdullah launched in May 1946, the ‘Quit Kashmir’ campaign. Abdullah was promptly arrested and incarcerated. Nehru, in a significant political statement that Jammu and Kashmir was his fiefdom, attempted to enter Kashmir and was speedily detained by Ram Chandra Kak, the Prime Minister of Jammu and Kashmir. Gandhi jumped into the fray and in a passionate letter to Jawaharlal Nehru, pleaded with Nehru to return to Delhi with the promise that the Congress would make Nehru’s cause in Kashmir, its own cause and Nehru’s honour, its honour. The CWC draft resolution, as usual authored by Gandhi contained the ill-concealed threat to the Maharaja of Jammu and Kashmir that Nehru would return to “retrieve his honour”, a threat which does not find mention in the official Congress Resolution. True to his promise to Nehru, Gandhi drafted the Congress resolution on Kashmir in the name of Maulana Azad, the President of the INC. Readers must read the resolution attentively to understand why Narendra Modi, Rajnath Singh, Manohar Parikkar and Amit Shah can do nothing different in Jammu and Kashmir and why they can do nothing to Pakistan. Gandhi’s insistence that the territory of this bhumi belonged in equal measure (in diminishing order of equality) to Muslims, Christians, Parsis, Jews and Hindus, in that order, was taken seriously by post-independence Nehruvian secular Bharat; Secular Bharat stood by and watched Sheikh Abdullah’s son Farooq Abdullah implement his father’s Quit Kashmir slogan faithfully in letter and spirit from 1989 onwards. His son Omar Abdullah by declaring that he will not allow Kashmiri Pandits to be re-settled in a well-protected Pandit region of the Kashmir Valley and nor will he allow Sainik colonies to be set up in Srinagar has only stated his intention to keep it that way. Narendra Modi and Amit Shah must put some steel in the spine of the government and work towards altering the arithmetic of religious demography which is influencing electoral politics in the jihadi state. The Kashmir Valley’s quota in Lok Sabha constituencies and state assembly constituencies is unnaturally weighted in favour of Kashmiri jihadis. 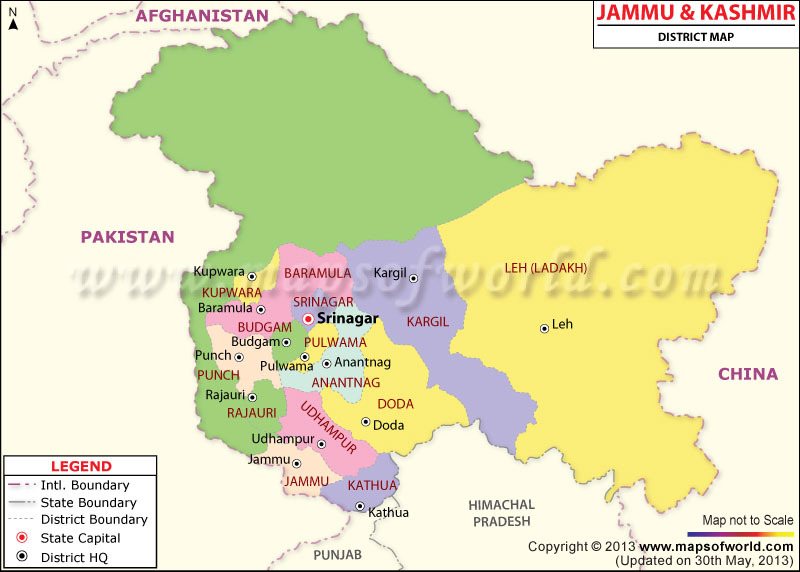 The J&K state has six Lok Sabha seats – three from Kashmir valley, two from Jammu and one from Ladakh. The Legislative Assembly was initially composed of 100 members, later increased to 111 by the Constitution of Jammu and Kashmir (Twentieth Amendment) Act of 1988. Of these, 24 seats are designated for the territorial constituencies of the state that were occupied by Pakistan in 1947. These seats remain officially vacant as per section 48 of the state constitution. These seats are not taken into account for reckoning the total membership of the Assembly, especially for deciding quorum and voting majorities for legislation and government formation. Hence the total contestable and filled seats of the assembly are presently 87. The Kashmir valley has 46 seats, the Jammu region has 37 seats and Ladakh has 4 seats. Two women may be nominated as members by the Governor of Jammu and Kashmir if he is of the opinion that women are not adequately represented. Alter the religious demography of the state in a manner which will loosen the Muslim stranglehold on the polity. Set up Sainik colonies in the valley with determination and resolve. Carve out a portion of the valley for Kashmiri Pandits and set up the Sainik colonies along the borders of Pandit habitations. Bring the tenure of the J&K state assembly in line with the rest of Bharat; reduce the tenure from the current six years to five years as it prevails in other states of the country. And as this government moves in this direction, Hindus must know and pass the word around that it was Gandhi and not Nehru who lit the jihadi fire in the Hindu kingdom of Jammu, Kashmir, Laddakh and Tibet. Radha Rajan is a Chennai-based political analyst. She is also an author and animal activist. The Nation Owes a Lot to Social Media….